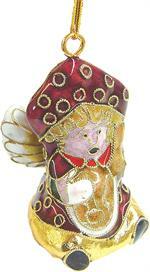 Item #R0701G: 3.5"x7.5" Cloisonne bell with gold background and assorted colors. Item #D&R-24279: 18Kt. Yellow Gold bell pendant with fifteen baguette Blue Topaz, Iolites, Amethysts, Garnets, Golden Citrines & Peridots of 2.93 Cts. TW & eleven round Diamonds of .10 Cts. TW set in White Gold.